A highback-to-backless booster offered by KidsEmbrace. The KidsEmbrace Fun-Ride High Back Booster is part of the Car seat test program at Consumer Reports. In our lab tests, Car seat models like the Fun-Ride High Back Booster are rated on multiple criteria, such as those listed below. 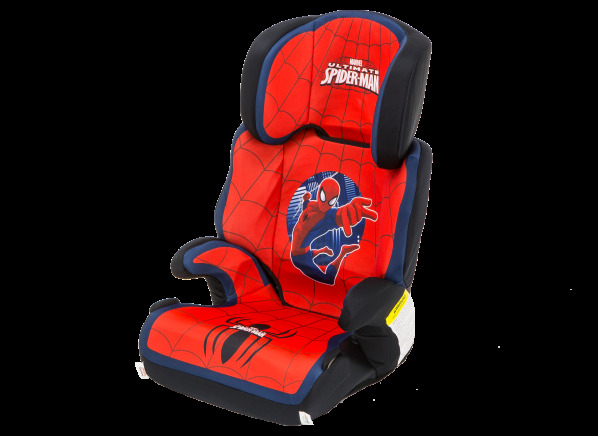 Booster fit (with back): A rating that reflects a booster seat's ability to correctly position the lap and shoulder belts in various test vehicles using a child-sized dummy, when used as a highback booster. Additionally, it includes an assessment of the booster's compatibility with vehicle seats and interior components. Booster fit (no-back): A rating that reflects a booster seat's ability to correctly position the lap and shoulder belts in various test vehicles using a child-sized dummy, when used as a backless booster. Additionally, it includes an assessment of the booster's compatibility with vehicle seats and interior components. Ease of use: Our evaluation of how easy each seat is to use, including items such as the clarity of labels and instructions, the ease of achieving an appropriate belt fit, and the transition between highback and backless modes where applicable. Weight range (highback) Weight range (highback) Range of weight (lbs.) allowed for child when using the seat in highback booster mode. Weight range (backless) Weight range (backless) Range of weight (lbs.) allowed for child when using the seat in backless booster mode. Height range (highback) Height range (highback) Range of height (inches) allowed for a child when using the seat in highback booster mode. Height range (backless) Height range (backless) Range of height (inches) allowed for a child when using the seat in backless booster mode. Seat weight backless (lbs.) Seat weight backless Weight of seat in lbs. Seat weight highback (lbs.) Seat weight highback Weight of seat in lbs. Base width (in.) Base width Width of seat base (inches) as measured from underside of seat. Overall width (in.) Overall width Total width of seat (inches) at its widest point. Overall height (in.) Overall height Total height of seat from base to top in highback mode. Width adjustment Width adjustment Indication of whether a seat has an adjustment for the width of the seat back in highback mode. LATCH connections LATCH connections Indicates whether seat offers the ability to attach using the LATCH connectors. Lowback shoulder belt guide/clip Lowback shoulder belt guide/clip Indicates whether the seat includes a belt guide or clip for lowback use. Cup/snack holder Cup/snack holder Indicates whether a cup or snack holder is included with the seat. Spanish language instructions Spanish language instructions Indicates the availability of spanish language instructions. None, Included or available.